Members of the public across Europe are being asked to look in their gardens or local green spaces for banded snails as part of a UK-led evolutionary study. The Open University says its Evolution MegaLab will be one of the largest evolutionary studies ever undertaken. Scientists believe the research could show how the creatures have evolved in the past 40 years to reflect changes in temperature and their predators. The six-month study, starting in April, will ask people to submit data online. Professor Jonathan Silvertown, from the OU, said: "I was thinking about Darwin year and how we could help people get an idea of what Darwin was talking about. "The banded snail has been studied for 60 or more years, so it's an ideal organism to use. It's something that's very common, we know what the genetics are and it's safe to handle." 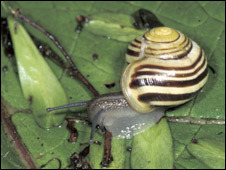 Professor Silvertown said there were two main evolutionary drivers that affect where yellow and brown banded snails are found. The first is climate - darker-shelled snails tend to be further north, and scientists believe this is because dark shells get warmer quicker than lighter ones. Darker-shelled snails could also be active for longer - which would make a difference to how much they could eat and how many offspring they could have. The second evolutionary driver is predation by thrushes. The birds hunt by sight and they find it more difficult to find yellow-striped shells around grass and brown shells against brown leaves - so yellow-shelled snails have been more common in grassland and darker ones in areas with brownish background environments. "We think [the snails] have changed in the last 40 or 50 years," said Professor Silvertown. "Firstly, the climate has warmed up, so we think the distribution of colours has probably changed. "Secondly, thrushes have become far less common in the last 30 years or so - so snail colouring in different habitats might be less important." This is what the Evolution MegaLab, which will run from April to October, will be trying to discover. "There's a lot of historical data on the website," said Professor Silvertown. "We have data from the past on 8,000 or so snail populations, so if you submit your data on the website, it will automatically make a comparison telling you whether there's been any change in your area." Professor Silvertown said this was a genuine scientific study and not just a public relations exercise. It has been funded in part by the Royal Society and the British Council, and he and his team are hoping that a major report will be published on the data collected at the beginning of next year. He also points out that this could be an invaluable tool for researchers of the future who will be able to look at this project and compare any further evolutionary changes.